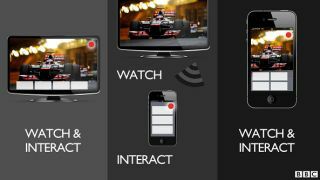 The future of red button functionality on the BBC has been discussed by general manager Daniel Danker, with the executive looking to a new connected service that offers Smart TV functionality for the next generation of television. Services on the red button have become a familiar part of the UK television scene over the past decade, and Danker's decision to use it as a hub for connected devices going forward has sparked concerns. However, Danker responded to one question on his blog by saying, "Today's Red Button remains; Connected Red Button services will augment this experience by bridging broadcast with the internet." The latter part of the response is the crux of the BBC's plans although it ties in with the scaling back of traditional red button services, something which takes up valuable spectrum. "Red Button has its limitations," said Danker's original post. "Because it relies entirely on broadcast technologies, Red Button competes with other channels for spectrum." "This is a scarce resource. So scarce, in fact, that this year we've seen a phased reduction of broadcast Red Button services, as part of our Delivering Quality First strategy. "This presents us with an opportunity to give Red Button a new lease of life, taking advantage of new web-based technologies that deliver richer, more visually-enticing experiences." Danker believes that the red button should 'seamlessly' bring broadcast television together with the internet. "This new "Connected" Red Button will become the foundation for interactivity around the BBC's television channels on the TV." Danker gives examples of quick access to past episodes on iPlayer, or bringing up and saving recipes for later perusal, and is hoping to bring the experience to screens other than televisions. "We'll be exploring ways we can extend these experiences to mobile and tablet devices also," he said. "At the BBC we're bringing the very best of Red Button together with the very best of BBC Online, to reinvent the experience on any screen. "This is our vision for the future, and I hope to build on this in more detail later in the year."